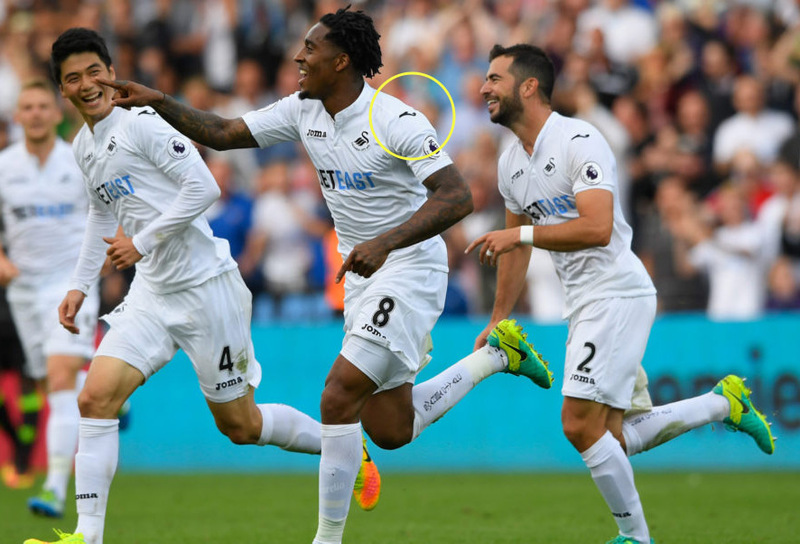 Much to the annoyance of many Swansea City fans, Joma were announced as the club’s new kit supplier in June this year, replacing Adidas whom had been the official shirt supplier since our inaugural season in the Premier League. Personally I wasn’t really bothered who supplied the kit as long as (a) it looked good and (b) was value for money – especially when the kids nag each season to have “the new Swans shirt”. Like most fans, I really didn’t pay much attention to the finer details of the shirt design. Well that is until prior to the Chelsea game this weekend, when my dear wife spotted something whilst we watched the two fallen giants of English football (Villa and Forest) battle it out on the concourse TVs in the stadium. “The J on the shirt is the wrong way around” – she remarked. “What?” – I said (using the tone of voice used when you want to watch the football rather than speak to anyone). 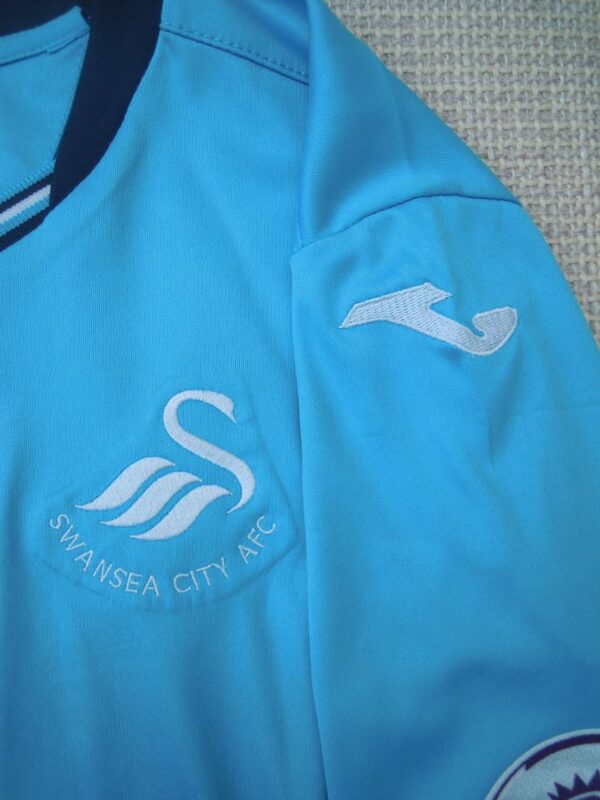 “The J on the Swans shirt, look at it, it’s the wrong way around! I can’t believe they’ve cocked-up the embroidery on the shirt! !” – she said with an increased level of anger. 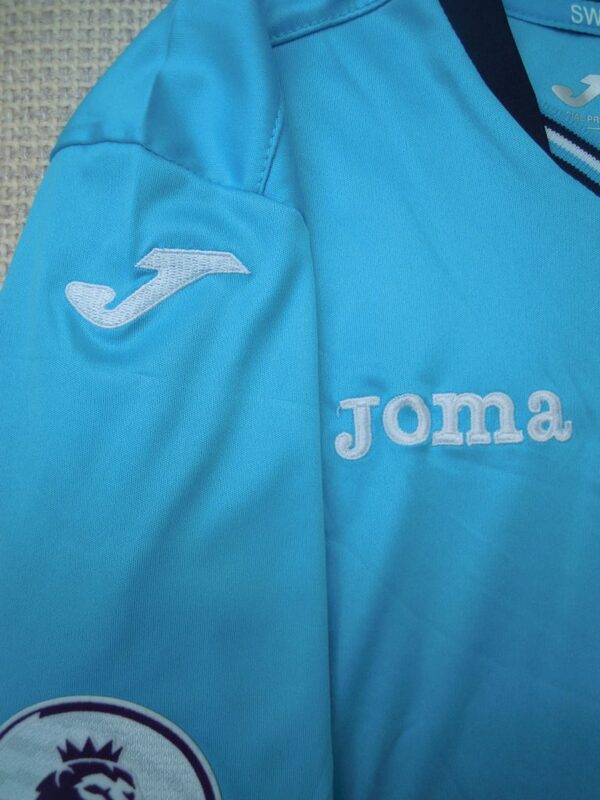 Lo and behold, as you can see from the above images, the Joma “J” is facing the wrong way on the left sleeve! Bizarre. At first we thought we’d been done by Moira in the club shop – who was going to cop a load of grief post game as a result – until we (well my wife) decided to have a nose at everyone else nearby whom was wearing a Swans Joma shirt (home or away). Flaming heck, everyone’s jersey was exactly the same!! So did this also mean that our 11 heroes in white (or faded blue) also had a dodgy “J” on their shirts? Whilst it really doesn’t matter in the grand scheme of things (and as long as the Swans are doing well lol), I do wonder why the “J” is facing the wrong way. Is it a Joma brand “thing” or is it a genuine fault? Maybe the Americans are to be blamed (joke), who knows and possibly who cares, but it is a little bit odd.